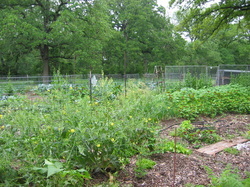 We adhere to Permaculture methods as closely as possible. We have permanent 4' rows that are heavily mulched to keep down weeds and prevent water loss. Prior to this we have our pigs till by rooting and over time they also deplete the weed seed bank. Our eventual goal is to be organically certified and have no imports; be a closed loop system. This means growing all our animal's food needs on site. The only thing we may import would be seeds and these can be locally sourced. Compost tea, green manure and cultivating the soil/food web is how we are bringing fertility to the soil. Our farm is located in the bio-region know as the Posy Oak Savanna, in Eastern Travis County near Webberville.